You must make reservations at least 5 minutes in advance of the time at Sailor Jack's. 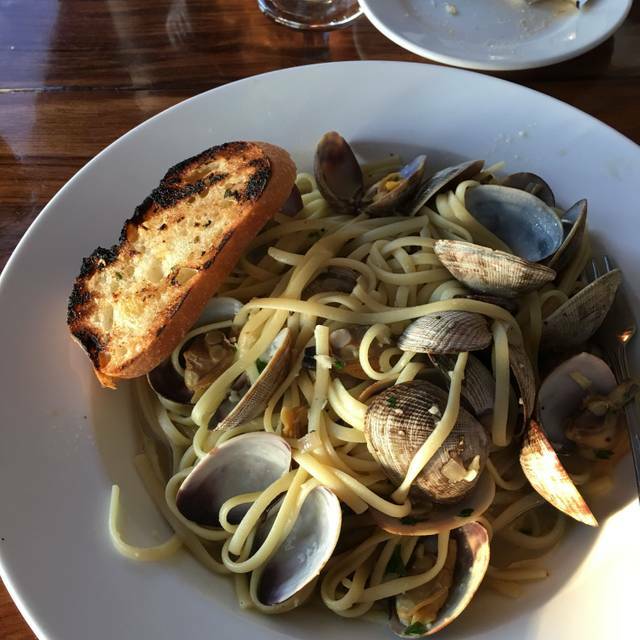 Sailor Jack’s is the top restaurant in Benicia for seafood served with California flair. Located on the scenic Carquinez Straits, our seasonally changing menu offers something for everyone at breakfast, lunch, weekend brunch and dinner. Named for author Jack London who lived nearby and loved the area, our menu is naturally complimented by a carefully curated selection of great wines and signature cocktails also available in our comfortable upstairs bar. 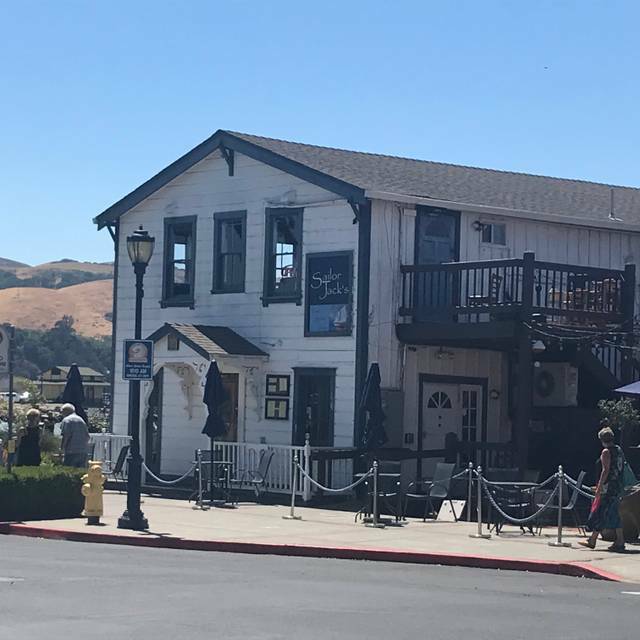 Located in a historic (circa 1868) sea captain’s home, the waterfront view setting is unique in Contra Costa, offering two floors and several charming rooms (plus outdoor deck and patio) where you can enjoy an intimate date for 2, a meal out with friends, or a major family celebration. Great breakfast, bloody mary and view. We had a very nice time for a Saturday "brunch". Nice view of the water and bridge. We went early so it was not too busy, even for a Saturday and was, therefore, quiet. My salad was very good, although I should have asked for dressing on the side as there was a little too much for my tastes. There were many menu selections of interest, making it hard to choose just one--will definitely have to return. Good value, too. It was my first time there and we thoroughly enjoyed it. I'll be back!! I try not to write negative reviews, but am compelled to share our experience from tonight. Started with apps that were pretty good, Ahi Poke delicate and with nice balanced flavors of ginger and soy, tasty crispy Brussel Sprouts and average Calamari. But the entrees, ugh! Overpriced halibut and a skimpy serving of sole, both dishes smothered in a bland and clumsy cream sauce that completely wiped out the fish - from both taste and sight. And I mean smothered! Paired with bland rice and some sort of sub par kale veg. Our dining partners seemed equally underwhelmed by the pork chop and chicken picatta. In fact, the Fish and Chips that their toddler picked at left me wishing I could go back. Hard to rationalize a kitchen that could serve up a tasty poke followed by fish that would be disappointing as a $9.99 apecial at (pick your chain diner). I find it hard to believe that there is any oversight of the food leaving the kitchen. We could barely even see the two small pieces of sole drowned in sauce. And our poor waiter. I felt sorry for him. He was very pleasant and tried hard, even when informing us before our entrees arrived that they had run out of French bread. And trying explain away the nearly one hour wait for our entrees. Would we go back? Heck, this place is a Benecia institution, right? Perhaps for a beer and an app at the bar, but our $260 dinner for four adults and a toddler was disappointing at best. And we brought our own wine! Sail on past Jack. Thanks for reserving the corner table as requested and appreciate not being rushed as we are a foursome who only see each other twice a year thus enjoyed our conversation. We were celebrating a friend’s birthday by having dinner. The service was fantastic! Three of us had the sole and it was not that good. Portions were small and the fish seemed very dry even with extra sauce. Also a couple small bones were in my fish. Unlike problems reported by some other diners, our problem was that our food was brought out too quickly! The server brought the appetizers, and then no more than two minutes later, arrived with the entrees. There are worse problems to have, so I don't want to complain too much, and he was very apologetic and asked several times if there was anything he could do to make it right. Food was great, view was lovely, with no ugly plated food, drunken owners, ragequitting chefs or any of the other recent complaints I read before we headed out. We went to Sailor Jack's for a family birthday and were delighted. What a fabulous view! Loved the location. And the service was wonderful. We actually had one extra person to accommodate and they jumped right to making the minor adjustment and putting us at a slightly larger table. Thank you! Good food and drinks at a reasonable price, with beautiful views. Ahi tuna excellent -- tender, perfectly seared on top of creamy garlic mashed potatoes; clam chowder to die for; green salad fresh and great blue cheese dressing. Fish and chips were batter fried and not crispy, but good cole slaw on the side. It is a nice spot on the water and wait staff is very good. The food is a mixed bag. Some items were really good, others not so much. People in my party who had seafood omelett and fish tacos said they smelled way too fishy and left the seafood. My smoked salmon was really good. Perfect for a stormy, lazy brunch with friends, upstairs, water view,attentive but not intrusive service. Food was marginal, the order didn't come out at the same time, lobster was rubbery the Brussel sprouts were burnt and the green beans over cooked. This was second chance and the last one for us. Great place to eat! Nice variety of seafood, steak, & pasta on the menu. Nice views. Great service. Good food, good view and good service!! We made the mistake of sitting at a table near the bar so the overworked bartender was essentially our waiter. It took us over three hours to eat dinner and parts of dinner were tasteless. We found out halfway through the meal that the chef had quit in a huff that evening. Usually food/service is better, maybe better luck next time? Since I live close by I've been a frequent visitor to Sailor Jack's throughout the years. Actually, the house is where my daughter's baby sitter lived 45 years ago, so I know it well! The food was often hit or miss but lately it has improved to the point that it's become one of my favorites especially for fish. BBQ oysters are incredible and cocktails are great; sometimes service is slow if crowds arrive. The bread pudding is excellent and worth the calories! Sadly, I chose this restaurant to have a nice Valentine’s dinner with my 80 year old mother. I drove from Santa Rosa to Benicia. They overbooked, we had to wait half an hour for our reserved table, we were handed a menu and upon ordering, the server said we had the wrong menu. The new other menu prices had been raised. Brussel sprouts went from $10 up to $15 now. Hurried servers crashed dishes into their work station near our table, and the food was just average. The evening was disappointing at the price of $150 for the two of us...won’t be back. I made reservations for 2 and it was scheduled for 1:45 pm we called at 1:40 to inform them that we were running a little late they said that’s fine, don’t worry. We get there at 2:00pm and the hostess said they gave our table away. We told them we called in advance and the hostess said who did you speak? We didn’t get a name. I asked how long do they hold a table for and she said 30 minutes, I looked at my watch and it was 2:04pm. The 30 minutes were not up yet. For a first impression and that experience I won’t go back. We mostly enjoyed our dinner at Sailor Jack's on Saturday night, 10th of Feb. We got together for my birthday: my father who is 87 and his wife live in San Jose; my brother is a physician and lives in Oakland; and my son and I live in Davis. We all traveled far to come for a nice dinner together. The food was excellent, but the service was the worst we have ever had at Sailor Jack's. Three dinners of Fish and Chips were served (and got cold)while we waited a full ten minutes before the other two dinners were served. My father asked for a cup of decaf coffee three times during a thirty minute period before he received it. I also had to ask for hot water three times for my tea. The waiter clearly needed some support. There were only four parties at tables when we arrived. The entire place filled up before we received our food. We were seated next to an extremely loud group. We were literally unable to hear each other. It was not my favorite birthday event. . . especially since the group next to us was so VERY LOUD and the service left a lot to be desired. First time at Sailor Jack's. Service was excellent. Drinks were great. Dinner was great. Definitely coming back! I used to love to go to Sailor Jacks...thru all of their owners... So did my friends...I am the last to finally agree that it is not what it used to be. It feels like they are on their last leg...Some of the reasons my friends stopped going is because they felt it was not a clean restaurant ..meaning that everything was sticky and..well it just looks dirty. I felt that way too this last time. I have never necessarily been disappointed with the food. But with a class restaurant right next door...well guess I 'll choose next door. Its a shame because they have a great piece of land with beautiful views...I'll miss it in a way. Bare in mind that we were there on New Year's Eve, these folks were on a dead run accommodating many groups with a "special" menu. From my point of view they did a great job. This said, my dinner was wonderful, the other three in our group felt the same. Due to the date, I felt service was rushed & our server could only provide limited time with us. It was a small thing, but it still bothers me that when asked, our server advised us that bread was not being served. This when the "special" menu indicated bread was served with dinner and I could see bread & butter served at the adjacent tables to us. Beautiful views and consistently good food. I love Sailor Jack's. Food is wonderful. Wait staff is top notch! We were seated upstairs, which I like. But, we were seated at the 4 top right next to the stairwell. Very distracting with waitstaff going up & down the stairs. Also, overheard quite a few snippets of conversation by waitstaff complaining about other waitstaff and about customers! Don't get me wrong, I GET IT. I don't fault the waitstaff AT ALL. I was a waitress for 10+ years. You have to vent .... or lose it! And you never want to lose it! My suggestion is to the restaurant -- I suggest removing this table from service. I understand that you need to make the most of your space but it's akin to being seated next to the bathroom. In addition, it is directly in front of the area where waitstaff enters the bar area and also where they leave their tray stands. Twice, a stand fell over (not loaded) but, still it was like a bomb going off behind our heads. I don't think the loss of one (1) 4 top should break the restaurant. First time at Sailor Jack with two of my friends, it was recommended at did not disappoint. Great food, friendly service, fantastic views, easy parking that is free. Great food and wonderful views. Our server, Leslie, was absolutely wonderful. She checked in often making sure we had everything we needed, very warm and friendly. We also felt that the quality and amount of our entrees were well worth the price. Too long waiting time between salads/soups to main entree. Our party of 3 was treated to a very pleasant social and dining experience. We all enjoyed our lunch choices and would return again. Appreciated the restaurant honoring our request for a quiet table by the window ... and didn't rush us as we continued to talk after lunch. One of our local favs and we’re lucky! We live in town so it’s a true neighborhood spot to drop in!